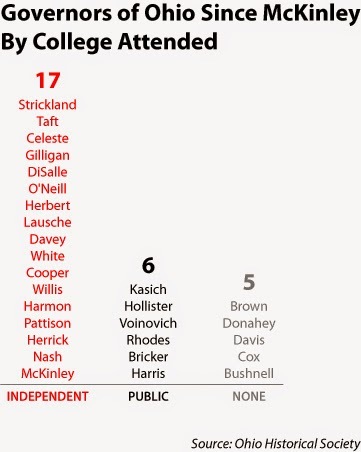 As promised with today’s AICUO Graph of the Week, here is the list of governors of Ohio, beginning with William McKinley, and the colleges they attended, if any. It wasn’t that long ago that a bachelor’s degree was not required for admission to law school, and that the first degree in law was not considered advanced but just another bachelor’s degree. Such was the case for Governor Frank Lausche, whose first degree earned was an LL.B. at what at the time was the independent nonprofit John Marshall Law School in Cleveland, which became part of Cleveland State University in 1969; and also for Governor Thomas Herbert, who attended only Case Western Reserve Law School. National Normal University, which Governor Myers Cooper attended, was a teacher’s college located in Lebanon; it closed in 1917.